Top: dBA Acoustics installed an audio system consisting of Community Professional Loudspeakers R and W Series speakers. Bottom: Lynn Stadium is home to the University of Louisville’s soccer team. It includes a 15,500-square-foot training center, a large video scoreboard, along with its Community-based sound system. 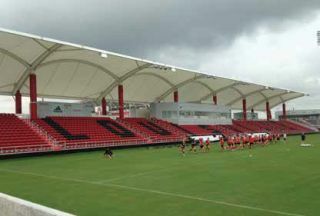 Billed as “The nation’s most spectacular college soccer facility,” Dr. Mark and Cindy Lynn Stadium at the University of Louisville features seating for more than 5,300 soccer fans, a 15,500-square-foot training center, a large video scoreboard, and an audio system with Community R Series and W Series loudspeakers. Designed by consultant Tom Lorenzen of dBA Acoustics in Louisville, KY, the audio system provides clear announcements and high-fidelity music to fans in four separate seating areas and to players and officials on the field. Lorenzen said the university’s goals were excellent audio with even coverage throughout the various seating areas and on the field. To meet these goals, he used a combination of designs. Fourteen Community W Series WX‑1594 loudspeakers, distributed along the underside of the canopy, provide sound for the stadium’s 2,300-seat covered grandstand. Eight R Series R2‑474 and four R2‑77 loudspeakers, installed on lighting poles and on the video scoreboard, provide sound for the field, the end-zone bleachers, and the stadium’s two grassy berms. Three R.5-99 loudspeakers, also mounted on the scoreboard, cover part of the east berm seating and a pair of Community D Series DS8 surface-mount loudspeakers with a separate amplifier provide an independent sound system serving a patio garden near the concessions area. The loudspeakers are powered by Lab.gruppen amplifiers, and a Biamp Audia-Flex DSP provides equalization and delay to assure consistent sound arrivals throughout the stadium. The press booth includes a Shure announce microphone and an Allen & Heath mixer, and Shure wireless microphones are used on the field. Bland Technologies of Louisville installed the system adding a custom touchscreen user interface to control the various speaker zones and presets. The project was completed in time for standing-room-only crowds to witness the Louisville Cardinals opening game soccer victories in their 2014-2015 season.